Marina Rose, QDNA®, Founder, QDNA® Quantum DNA Acceleration®, a revolutionary new technique for quantum growth in health, life and business. Less than a few generations ago it was the common belief that the coming age of technology would make life simpler and easier, freeing us from the drudgery of mundane personal tasks, automating work, and heralding in a new age of economic progress and individual freedom. So confident in the benefits of technology were we, that many of the predictions back then sounded much more like actual promises, leaving us all to expect that the many high tech tools and trendy personal gadgets coming our way would all but guarantee that we would find ourselves happily living in futuristic bliss — working much less, vacationing much more, retiring far earlier, and in general, having so much free time on our hands that we would all soon be pondering just what we were going to do with it. Although there’s no doubt that the arrival of computers, Internet, smart phones, 3D Printers and the whole myriad of today’s amazing technology has dramatically transformed our world in many powerful and unimaginable ways, unbounded freedom from economic progress however is certainly still illusory — if not intangible for most — and nearly everyone, everywhere, seems to be far busier than ever. In the hyper-active, traffic-filled, email-driven, turbo-charged, social media shared world that we live in today, far too many of us find ourselves in perpetual motion, leaving us sleep-deprived and forever rushing. We struggle to keep up with work, busy careers, and all that’s happening in our personal and family lives. Despite our never-ending selection of time saving gizmos, quality distraction free personal time for ourselves is now increasingly more elusive. In a surprising and unpredictable twist of irony, Baby Boomers, Gen Xers and even Millennials now find themselves looking back at the past and lamenting the good old days when life was more minimalist and simply not so busy. And if we’re not careful, days, weeks and even years can vanish in a blink of an eye, with the effects of being so “crazy busy” obviously shown. And it’s not just the wrinkles, extra greys or superficially how we look on the outside, but even more concerning is how all this busyness affects us on the inside, particularly in terms of happiness, optimism, enthusiasm, and in general, how we actually feel. If as the saying goes, age is not how old you are, but rather how you feel, then we can all take heart knowing that despite living in the “Age Of Perpetual Busyness”, enjoying a simpler, healthier and happier lifestyle is still well within reach. And the good news is that science now shows that doing so can not only have a dramatic positive impact on the quality of our lives, but can actually even slow and reverse aging. The first steps to feeling healthy, happy and energetic at any age begins with creating a wholesome and balanced lifestyle. While exercise, diet and nutrition does wonders for the body, balanced living is much more than that. It also requires a commitment to building essential habits that nourish and nurture the mind and spirit. Not only does incorporating daily yoga, meditation and other forms of mindfulness practice provide this nourishment, it also serves as a natural counter-balance to the perpetual busyness and everyday stress of our hectic modern lives. And if that wasn’t already incentive enough, research has now shown that it can also dramatically impact the rate of our cellular aging. In a research study that was conducted by scientists at the University of California, San Francisco and the Preventive Medicine Research Institute, a nonprofit public research institute in Sausalito, California that investigates the effects of diet and lifestyle choices on health and disease, for the first time, scientists have shown that changes in diet, exercise, stress management and social support can directly impact the length of cellular telomeres. And the results are astonishing. In recent years, scientific research has demonstrated shorter telomeres are widely associated with a broad range of aging-related diseases, including many forms of cancer, stroke, vascular dementia, cardiovascular disease, obesity, osteoporosis and diabetes. But the good news is that the UCSF study shows that living a healthy and happy lifestyle can make a difference. In the study, researchers followed thirty-five men for five years who were diagnosed with early-stage prostate cancer, exploring the relationship between comprehensive lifestyle changes, telomere length and telomerase activity. Ten of the patients underwent major lifestyle changes including eating a plant-based diet rich in fruits, vegetables unrefined grains, and low in fat and refined carbohydrates. This group also began a regime of moderate exercise, such as thirty minutes of daily walking, as well as stress reduction that included yoga, breathing, and meditation. They also participated in weekly group support to aid in their emotional recovery. They were then compared to the other twenty-five participants who were not asked to make any significant lifestyle changes. 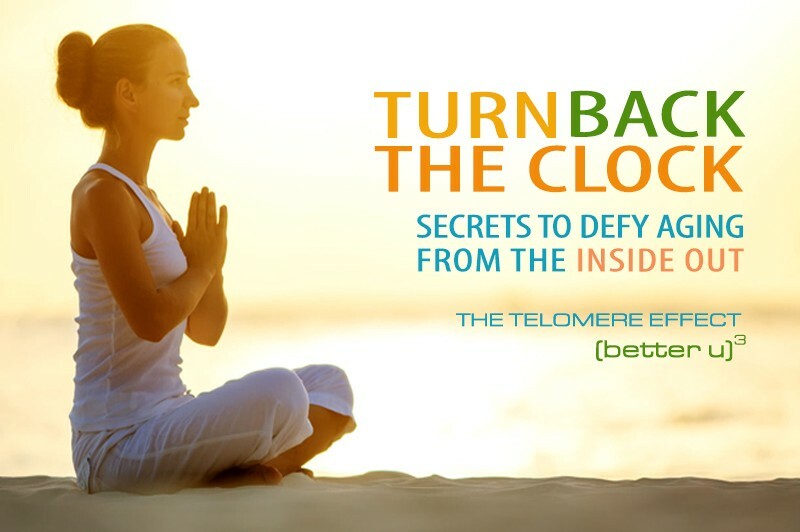 Remarkably, without any direct medical intervention, the group that underwent major lifestyle changes experienced a “significant” increase in telomere length, as much as ten percent in all cases. In addition, the more these changes were sustained, the more dramatic the improvements in telomere length. When researches compared the results to the control group who made no changes to their lifestyle, this group demonstrated measurably shorter telomeres over the five-year period, with as much as 3 percent overall reduction. And the researchers say the results are likely not at all limited to prostate cancer, but are rather likely to be relevant to general overall health and aging as well. Sleep is not a luxury. Sleep is an indispensable essential requirement for our health and wellbeing. We actually put our health in jeopardy by sleeping less than we need. It’s one of the infamous game changing culprits that seems innocent enough at first and it is in fact a weapon of mass destruction to our health. Regular sleep deprivation is also an underlying issue that can promote a multitude of ailments including, Irregular Heartbeat, Heart Disease, Heart Attack, Heart Failure, Hypertension — High Blood Pressure, Stroke, Diabetes 2, Obesity, Increased production of Cortisol — also know as the Stress Hormone, Impaired Judgment, Stress, Depression, Anxiety, Mental Distress, Forgetfulness and Memory Loss. There is this infamous vicious cycle of stress, insomnia, stress and it’s a dangerous and devastating cycle to get caught in. The loop is lack of sleep creates stress, then stress creates lack of sleep / insomnia or vice versa. We don’t have to stay stuck in this sequence and it’s important to eliminate it so we get healthy long telomeres so we can live longer and sustain healthier lives. 10 Self Help Steps To Create Sleep Hygiene To Assist in Reversing and Controlling Sleep Problems-Insomnia. 01. Establish a regular bedtime routine & wake up rhythm. 02. Regulate mealtimes and fluid consumption. 04. Initiate a transition time to prepare for going to sleep. 05. Unplug from your Cell Phone, Computer, TV and all Electronics. 06. Unwind with some Mindfulness Meditation before going to sleep. 07. Engage in gentle and restorative yoga. 08. Invent your gentle transition activity that calms yours nervous system. 09. Diffuse Lavender Essential Oil to slow down nervous system. Now let’s go out there and create our healthy lifestyles incorporating exercise so we can lengthen our telomeres, get healthier and lengthen our lives. Part of the article originally published at MarinaRoseQDNA.com on April 1, 2017.